Sheldon Silver Filed for His Pension a Day After Getting Convicted of CorruptionHe could make more than $85,000 a year. Is Andrew Cuomo Getting Schooled?His rough treatment of the teachers’ unions is driving down his popularity. So why is he doing it? Meet Carl Heastie, New York’s New Assembly SpeakerThe candidate — and the hasty selection process — isn’t what reformers were hoping for. 5 Ways New York May Change Post–Sheldon SilverFrom legalizing MMA to education reform, the speaker’s ouster has a huge impact. Sheldon Silver’s Epic Fall Ushers in a New Era in AlbanyDespite his desperate attempt to cling to power, the speaker will soon step down. Report: Sheldon Silver to Step Down As Assembly SpeakerHe’ll let five Assembly Democrats take the reins. 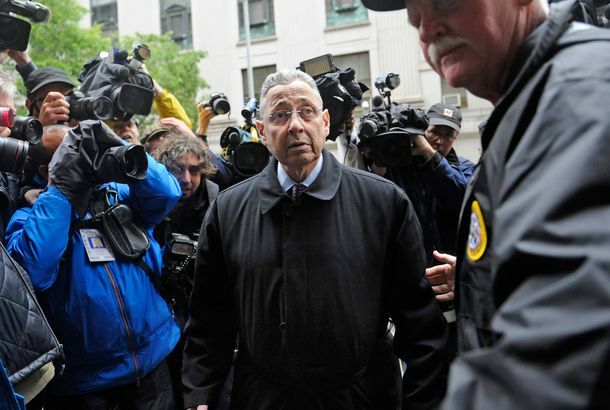 Tallying the Damage From Sheldon Silver’s ArrestThe effects are enormous and already rippling through Albany and the state. New York Assembly Speaker Under Investigation Over Law-Firm PaymentsSheldon Silver didn’t disclose. Silver Accused of Affair With Aide by LopezYou probably shouldn’t. Sheldon Silver Plans to Weather This Lopez Thing With an ApologyLots of people would like him to resign, but he’s not having it. Gross Assemblyman Vito Lopez Can’t Resign Fast EnoughHe’s still running for City Council, as well. Vito Lopez Probably Won’t Be an Assemblyman for Much Longer Speaker Sheldon Silver is threatening him with expulsion, and Governor Cuomo is urging him to resign. Grown Man Loses Internet Privileges for Humiliating Sheldon Silver on FacebookHe was just defending his boss (as a woman). Sheldon Silver Embarrassed by Facebook DefenderAnd writes sci-fi on the side. Vito Lopez Rips Those Calling for His ResignationNot backing down. New York Democrats Call for Vito Lopez’s Resignation The state’s DNC delegation doesn’t seem to be standing behind the assemblyman. Former Employees Say Vito Lopez Had a History of Slimy BehaviorPlenty to keep the ethics committee busy. Assemblyman Cautions Against Cuomo’s Gambling PlanAssembly Speaker Sheldon Silver supports Cuomo’s plan but says it may be a close call. Andrew Cuomo Is Meeting in Secret with Sheldon SilverTransparency right from the get-go! Great. New Report Accuses Democrats of Cronyism Over the Aqueduct Race Track In QueensThis doesn’t look good for Albany Democrats. Carl Paladino Is Going to Say Something on TV TonightPaladino buys airtime across the state for mysterious announcement. New York May Tax Out-of-State Hedge-Fund WorkersConnecticut is no longer safe! New York Budget Situation Still a Big MessThe legislature comes up with its own plan, one that isn’t making Governor Paterson happy.